Ep 2: Do You Practice What You Preach? In this episode, Jared and Alex talk about what it really means to practice what you preach in the realms of workouts and self-care. ASK ME ABOUT MY BALLS! The key to life is being able to personally apply the advice you give to others. 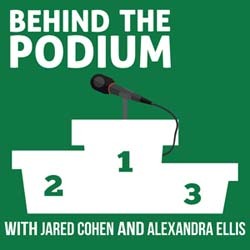 In Behind the Podium, Jared Cohen, Alexandra Ellis and guests discuss the struggles, philosophies, and evolving practices of coaching—being a coach, having a coach, and or any avenue of providing value for another individual that advances his or her life. Subscribe and listen wherever you get your podcasts from! Never miss an episode again! We'll keep you in the loop every time an episode goes live. We respect your privacy. Your email will never be shared. Like ever. We pinky promise. Behind the Podium is super grateful for the support of our sponsor, Procabulary. Learn how the words you say and think can upgrade your life with the Core Language Upgrade. New language can uncover possibilities and opportunities to help you break through old patterns. Use the code "podium" at checkout to save $100. Designed By: AE Wellness Design | Copyright 2018 Alexandra Ellis + Jared Cohen.